New funding to unlock housing schemes across Sussex has been announced by the Government today (Thursday February 1). 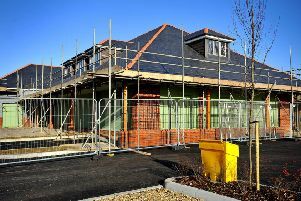 A total of 133 council-led schemes across the country will receive a total of £866m from the Housing Infrastructure Fund to support work to make developments viable so that homes are built quicker. Successful bids include schemes in Crawley, Burgess Hill, Shoreham, Hove, Lewes, Battle, and a site between Bexhill and Hastings. Chancellor Philip Hammond said: “Today marks the first step of the multi-billion pound investment we announced at the Budget to help build the homes our country needs. “This fund finances vital infrastructure such as roads, schools and bridges, which will kick-start housing development in some of Britain’s highest-demand areas. “This support will help us meet our ambitious plan of building 300,000 new homes each year and ensure we have enough housing in areas which need it most. Housing Secretary Sajid Javid added: “Our priority is building the homes this country desperately needs. “This first wave of investment totalling £866 million will help get up to 200,000 homes off the ground, making a huge difference to communities across the country. • £4.4m for acoustic barrier at Forge Wood, Crawley of 1,900 new homes. • £2m for an alternative access at Telford Place, Crawley for 300 homes. • £6.5m for mitigation of odour emissions from a waste water treatment works near the Northern Arc, Burgess Hill for 3,500 homes and a smaller site for 256 homes. • £10m for a range of infrastructure at the North Street Quarter development in Lewes. • £10m for regeneration of the harbour area including flood defences at Shoreham’s Free Wharf where 540 homes are being built. • £1.2m for decontamination and flood remediation at the 102 home Bedfordwell Road development in Eastbourne. • £2.2m for a sports village including 3,000 capacity community stadium at Combe Valley between Hastings and Bexhill next to 390 new homes. • £3.2m for a spine road and supporting infrastructure at a 252 home development at Blackfriars in Battle.